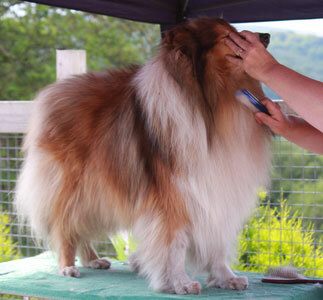 Keeping Your Rough Collie Presentable ! From the moment you take home your bundle of fluff at 8 weeks, you are responsible for its upkeep as well as its health and welfare. This includes the Rough Collies crowning glory — its coat. Keeping your collie in a presentable manner need not be a daunting task or a chore. Early training and routine brushing/combing are important, and must be enjoyed by both dog and owner, to prevent it becoming a battle of wills. 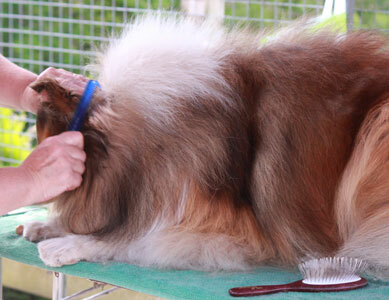 To help new owners achieve this, we have put together this short article, you can see how quickly and easily the Collie can be groomed, not for the show ring, but to keep knots and tangles, nails and teeth, as well as moulting under control. 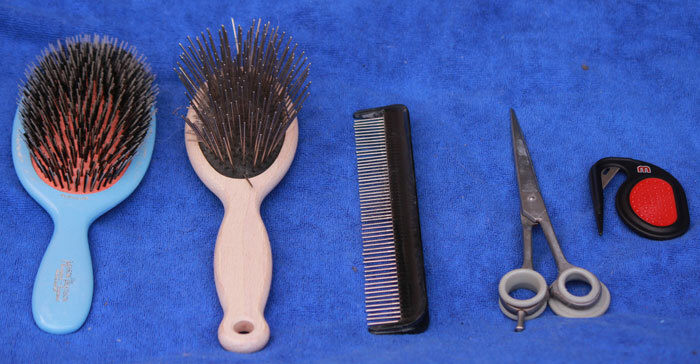 Bristle Brush, Long Pin Brush, Comb, Scissors and Matt Splitter. Of course there are a whole range of products and specialist tools, but we will just use the basics. Firstly, decide ‘where’ you are going to brush your puppy. By this we mean on the floor or on a table or raised surface. I use a grooming table, but have often used the chest freezer, with a rubber mat on it. Any raised surface that is strong enough to take your dogs weight that you can put a non slip mat on is fine. Remember that your puppy is going to grow — it may be difficult to lift as a fully grown adult ! A raised ‘table’ limits the dogs movement and also saves your back, but the floor may be more suitable for you. 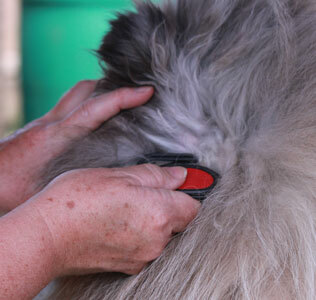 Using the pin brush, gently smooth the pup with the brush, as if you were stroking it. This is just for the puppy to become accustomed to the feel of the brush. Gently restraining with one hand and brushing with the other, will stop the puppy trying to bite the brush. 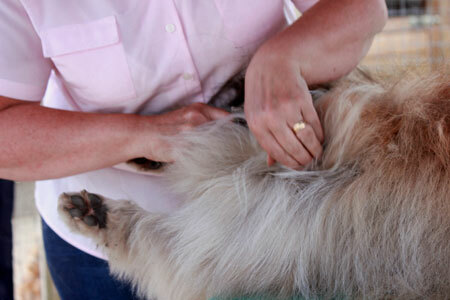 This gentle brushing will remove any ‘puppy fluff’. This needs only to be done for five to ten minutes maximum, as the puppy will become bored. Do this as often as you want, maybe three or four times a week initially, then less often, but for longer as the puppy grows. matt splitter for the more stubborn knot. 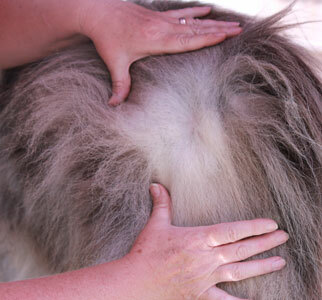 Even as a fluffy bundle, the following areas are in need of special attention. 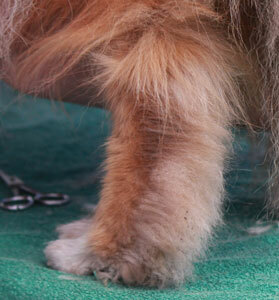 FRONT LEGS: The hair behind the front legs should be combed with the pin brush, then the detangle comb. Pay special attention to the top of the leg, at the point where it ‘joins’ the body. The hair here seems to twist and tangle as the dog grows. 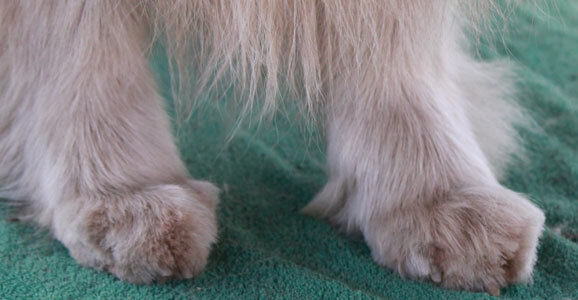 HIND LEGS: At a young age the hair on the bottom part of the hind leg should not be a problem, so a comb through will keep them knot free. As the puppy goes outside more bits of grass and twigs may become caught here. BOTTOM! : The fluff at the top of the puppies back legs should be brushed through, very gently and with no pressure or force, using the pin brush. 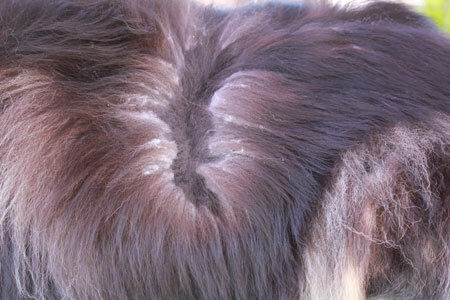 Extra care should be taken when grooming your male collie in this area! 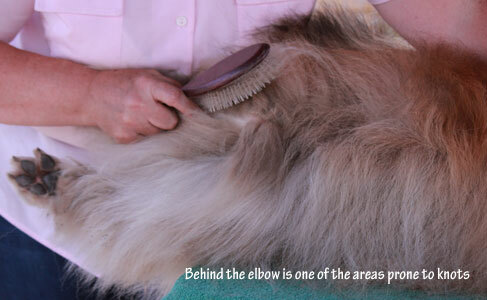 Using your free hand, lift the hair upwards and with the pin brush use downward strokes from the joint up towards the base of the tail Lift the tail up and to the side in order to brush right up to the base of the tail. 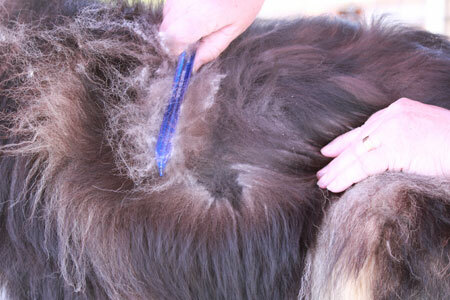 Should your puppy have any ‘deposits’, its better to snip them off, rather than try to brush /comb them out. TAIL: The tail should be gently brushed with the pin brush. Take care as the tail is very sensitive. 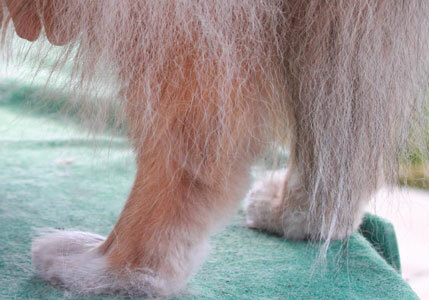 The hair underneath the foot seems to grow a lot. If this is left , mud, ice and snow can ‘clog up’ between the pads. 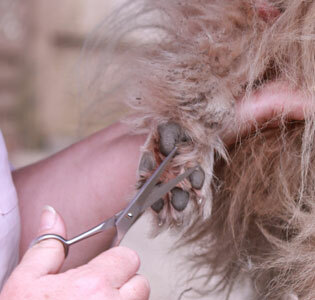 Holding the puppies paw so the pad is uppermost, with your sharp scissors, snip off the hair so it is level with the pads. 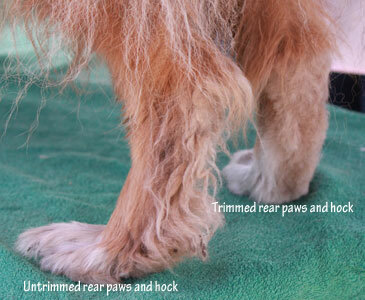 As your pup becomes older and more accustomed to this, you will be able to cut this hair shorter, and get in between the pads making the bottom of the foot almost hair free. Place the foot onto the floor, and snip the hair from around the foot, where it appears whispy to give a smooth rounded appearance. UNDERNEATH:- This is the difficult bit ! I am still unable to master it! Gently roll your puppy onto its back. Some puppies like this (they like their tummy tickled), others hate it. 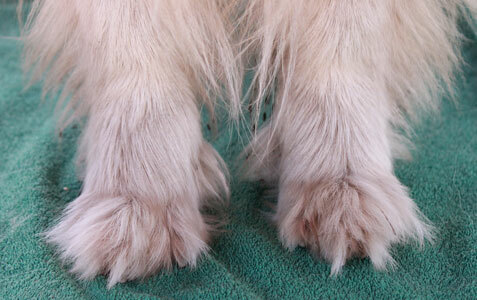 You may need an extra pair of hands to keep the young puppy amused while the belly, inside of the back legs and the chest area between the front legs is brushed with the pin brush. If like me, you are unable to do this, then let the puppy lay on its side and simply lift the legs one at a time out of the way. The whole of the above routine should take a maximum of 15 minutes with an 8 week old puppy. As the puppy grows, extend the time spent on each area. The adult collie looses their coat once a year for a male and females after their season as a loose and general rule. This is unlike the general everyday shedding of hair. 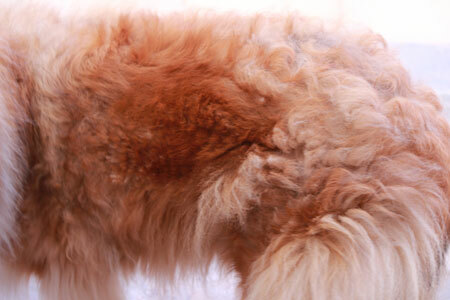 When the coat is parted, it is clear that the undercoat has left the body of the dog in large clumps. This generally starts on the shoulders of the dog. To remove this I generally give the dog a full bath. 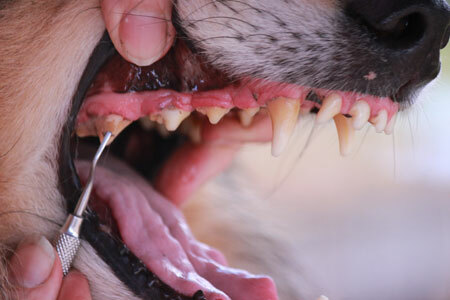 (The regular brushing should eliminate the need for regular bathing). 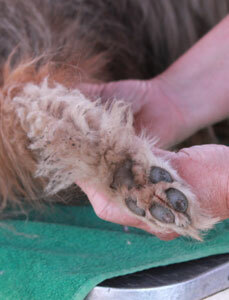 This bath will loosen the undercoat further, and make brushing easier. Firstly brush out any obviously loose hair, then bath the dog. This is best done as a two man job, to calm the dog and hold the dog steady. 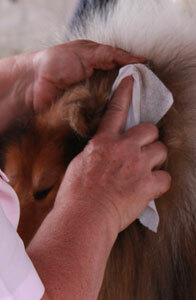 Then, either towel dry, by rubbing the dog or, if the Collie does not object, use a hairdryer. Its easier to groom a dry dog! Pin brush as usual first, then use the detangle comb. After a few weeks, you will notice the most of the shedding has stopped, and then bath again. Using the de-tangle comb first or matt splitter (left), gently comb the hair behind and to the base of the ear. 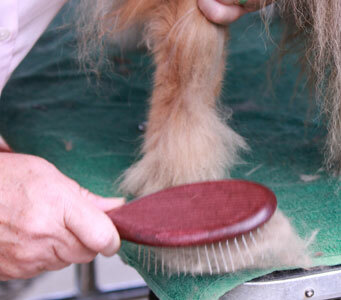 Even though there should be no knots here at the moment, this is a problem area, the skin behind the dogs ears is extremely thin, if there are any matts, be very careful when trying to remove them.. Use the wide side of the comb, then the fine side to finish off the ear. As an alternative to the matt splitter some prefer to use another tool called the matt breaker. Look inside the puppies ears, these should not be dirty looking, red or waxy. Wipe the inside of the ear with damp cottonwool if they do appear ‘mucky’ There should be no discharge, or strange smell from the ear.Never insert anything into your dog's ear canal. If there is any odour or discharge, please contact your vet. While the puppy is sleepy or laying quietly, check its nails. 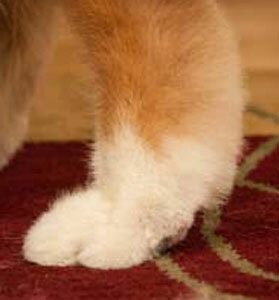 You will see (if you pull back the hair on the foot a bit), the nails are usually transparent. Sometimes they are black, but this is normal too! 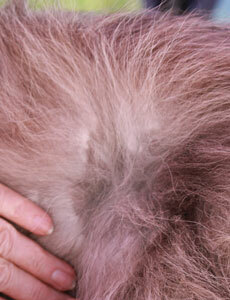 In young puppies the vein can be seen quite clearly. It’s a little pink line from the nail bed. If you have trouble, you could shine a torch from underneath, and the vein shows through. Using your own nail clippers, snip off the end of the nail. - A useful video here. Take care not to catch the vein. Don’t panic if you do, simply dab the nail into a bar of soap to stop the bleeding. (This can seem horrendous, but it isn’t really!) There is a powder available called Trimmex too. 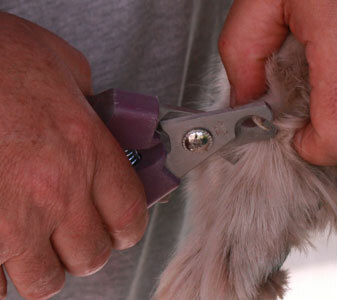 Some prefer to leave nail cutting to the professionals and most vets will trim your dogs nails for free during a routine health check, or a groomer will do them for you quite cheaply. The other is with a hand or Dremel nail sanding tool. 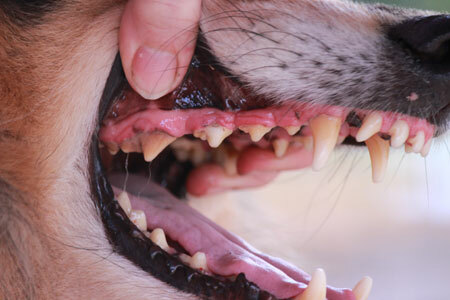 Some dogs are prone to more tartar than others. 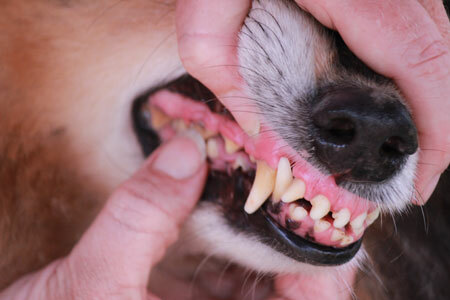 Some people prefer to clean their dogs teeth regularly with a toothbrush and others do well being given an occasional raw marrow bone or other hard treats. If however you see a build up of tartar, this can easily be removed with your finger nail or a dental scraper. Be careful not to scrape too hard as you will scrape off the enamel. You may be able to remove any plaque with your finger nail. 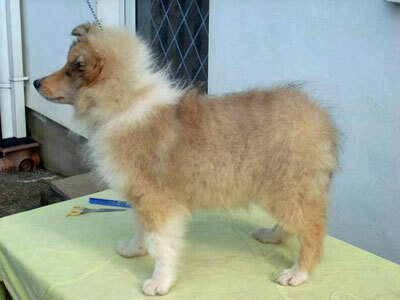 The Rough Collie coat consists of a harsh waterproof outer top coat and a thick undercoat which keeps the dog warm in the winter and cool in the summer. 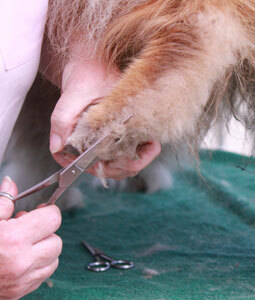 Considering the thickness of the coat, they do not suffer in the heat of our summer, and do not need to be clipped. 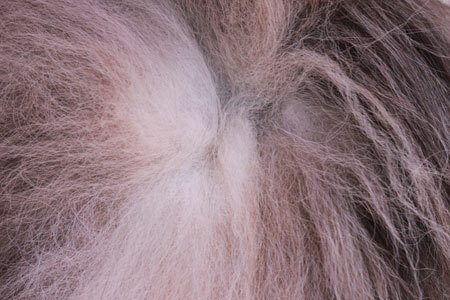 However, it is worth noting that when a dog is spayed/neutered, the texture of the coat changes. 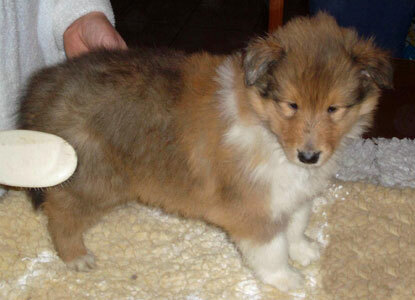 The Rough Collie is no exception and some get a coat similar to that of a woolly sheep, and it can become very difficult to manage, and something the vet rarely mentions when advocating that your dog be spayed. 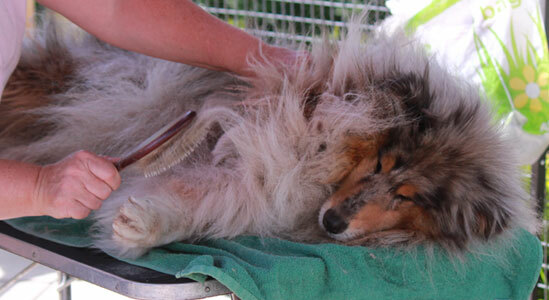 If your Rough Collie gets muddy, if you allow the dirt to dry, it can easily be brushed off. The only addition to the tools mentioned in this article that we commonly use is a grooming spray. You can buy fragranced grooming sprays from most good high street pet stores, or online which keeps your dog smelling fresh, or use water in a spray bottle which aids grooming. Many grooming sprays have built in detanglers and some maintain to help repel dirt too, especially useful if you have a Collie that has been spayed/neutered. If you feel you need help grooming your Collie, please ask your breeder, or any breeder in your area for advice, as they will be only too pleased to help. 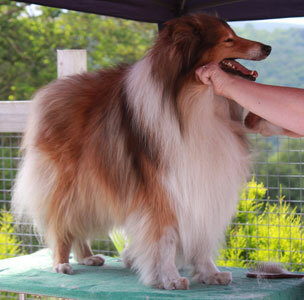 If you seek the help of a professional groomer, be sure to ask if they have experience in how to groom a Rough Collie, as some groomers, with little experience, will trim the body hair and featherings.